Forty-one hours of travel, and approximately seven hours of sleep. But the day we arrive in Paute, we hit the ground running. Monday night, we meet with our youth group. While there hasn’t been a gathering at SIP 91 in months, those same teens & young adults have been faithful to continue the meetings. 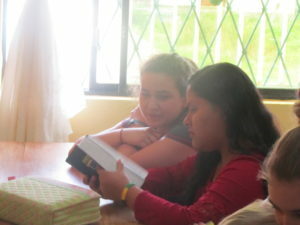 Anywhere from 12 to 20 youth read, study, and even memorize the Word of God every single week at Iglesia Renacer. 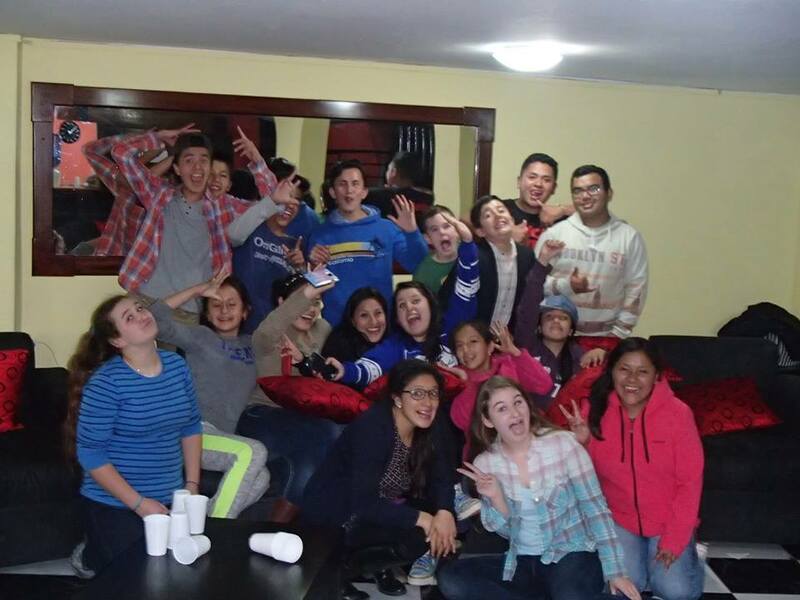 On nights like these, we thank God that it’s still legal to join together and worship in Ecuador. That our meetings aren’t held in secret, that our afflictions are few and our blessings are many. Around 7:00pm, we are reunited at the church. Big hugs, bright smiles, and loud laughter. How has it been five months already? How will I leave them in four short weeks? We jump into the back of Hermano Santiago’s pickup truck and drive to the top of La Loma de Paute, the highest point in our village. 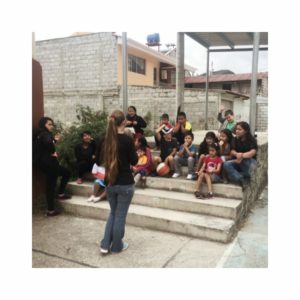 This is where Jenni’s family lives, miles from the school, market, and church. They make the climb down the mountain every day, like so many others in our community. Jenni’s mother meets us at the door. She looks completely exhausted, but she beckons us inside. Some of us sit on the wooden furniture, others stand against the walls. We are quiet & still. Cancer. They discovered it three months ago, but it was already much too late. No medicine, no treatment, no physician could make a difference now. Now it is up to God. Everyone in the room is visibly shaken. Jenni’s grandmother is approaching eternity with each shallow breath. Our bright smiles and loud laughs are absent now. We surround the sick bed & pour out our hearts. We do not pretend to understand, because very few of us have lost a family member. Our human empathy does not scratch the surface of their pain. But what we cannot understand, God does. So we begin to pray. Our voices quake, our cheeks glisten with tears. I can’t count the hours I’ve spent debating with these guys, who constantly leaf through their pages of highlights & scribbled notes, who constantly quote the scriptures. I can’t count the times I’ve heard their pray requests – asking each other to go to God on their behalf. But I have never seen them like this. I have never witnessed such complete and utter vulnerability. 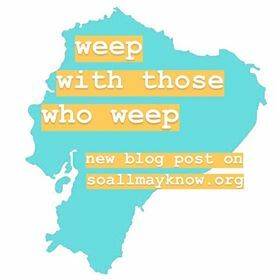 We are learning to rejoice with those who rejoice & weep with those who weep. 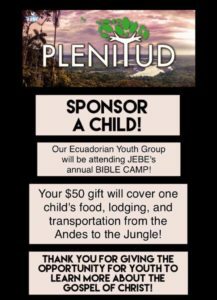 Please consider supporting our groups opportunity to attend Bible Camp! Your donations will allow them to grow in Spirit and In truth, as JEBE and So All May Know encourage them to become future pastors, prayer warriors, and believers of their generation. Exactly! The devotional I am reading really hit the nail on the head. Regardless of the calling that God has placed on your life (teacher, pastor, missionary, plumber) we need to guard the space in our lives that is meant for God. Personally, I struggle with balance. You? 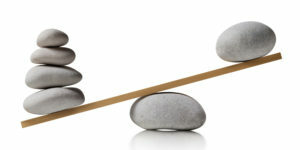 We can find that balance when we prioritize and seek God first. He’ll enable us to sort out the rest. Begin, and end, with our Father. Last Tuesday Was #givingtuesday, but it’s Not Too Late ! Last Tuesday was #givingtuesday, but it’s not too late to start supporting soallmayknow.org! We are so grateful for everyone who supports us in sharing the Gospel with the peoples of Ecuador, from the jungle to the mountains. Why wait for Giving Tuesday? 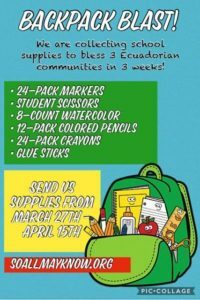 Now is a great time to give. 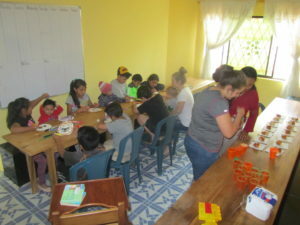 We’ve attended our last Ecuadorian church service, we’re cleaning out the pantry and fridge, doing laundry and packing. Leaving is hard even though we are excited about coming “home” for 6 months. We leave Paute on Wednesday to head over the Andes to the airport in Quito. Please pray for our family that we will be sensitive to the Holy Spirit and have God’s protection spiritually, emotionally, mentally and physically. It’s time for a furlough. Now that we’ve set a date, we’re excited to share that we are returning for a 6 month furlough on December 1, 2017. This will give our family a time to decompress, refresh, and refuel for the future. We’re are looking forward to reconnecting with family and friends. Can’t wait to see you! 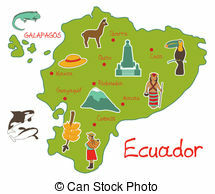 We’re leaving Ecuador on December 1st! 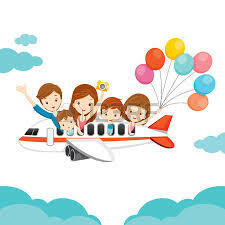 Please pray for a safe and uneventful flight and re-entry. 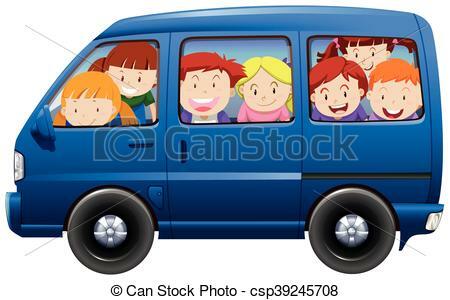 We need transportation that seats 6. Do you know of a great deal? You can continue to partner with us. We’ve already been blessed with places to stay during this time, and we are so grateful. Prayers for our family. Being in full time ministry on foreign soil can be tough. Prayers for our future. We will be prayerfully considering serving in foreign missions for 6 months and serving in-country (USA) missions 6 months. More on this as we have definite answers. Prayers for our children. Ranging in age from 17 years to 18 months, the needs vary greatly. Everyone adjusting to another culture, missing their old home and making friends is up at the top of the list. Madeline starting university is another big one. Transportation. Finding an automobile(s) that is suitable for 6 people, luggage and is road worthy to cover the southeastern states is our goal. Yep, that’s what we are looking for! Continued support. If you have been praying (we know you have!) and/or supporting us financially, know that we still need that support. 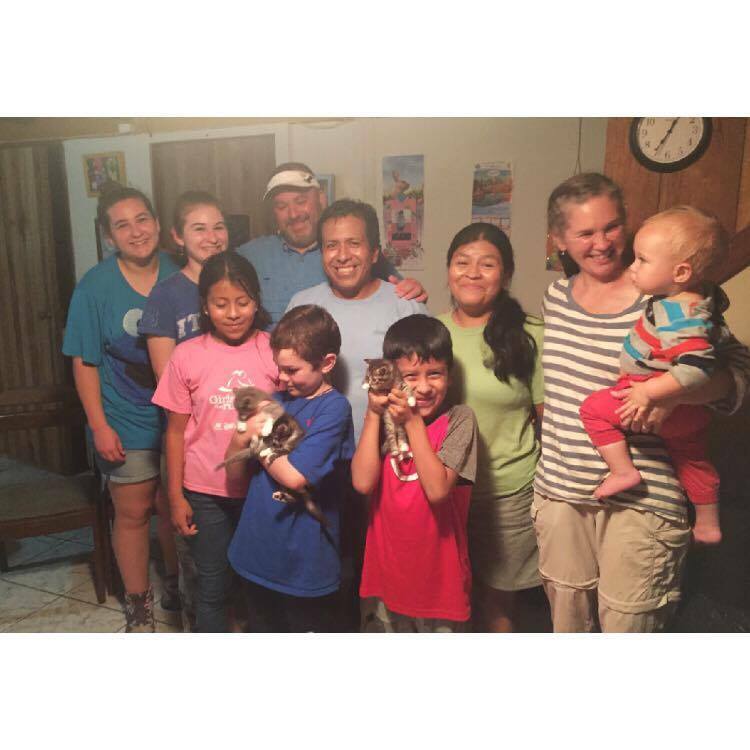 Our expenses in the US are higher than in Ecuador and sometimes furlough is more stressful than ministry overseas. 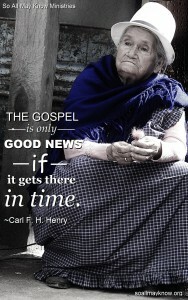 Time and time again, God uses His people (you) to provide for our needs. Thank you. We know that you are an essential component in our ministry. Your prayers, encouragement, support and feedback are critical. Thank you for being part of the body that allows us to serve as HIS hands and feet. 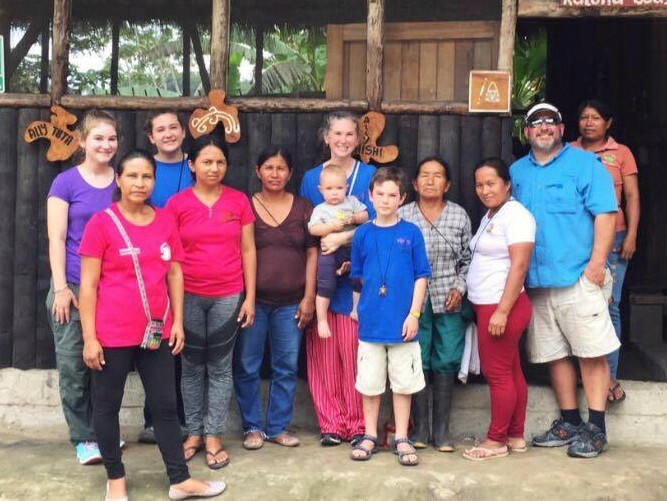 Studebaker and Escoba Families in Misahualli, Ecuador. 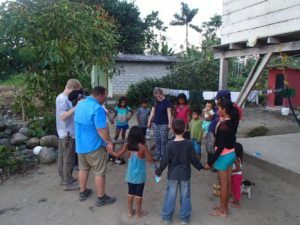 The Studebaker family serves as full time missionaries in Ecuador, South America, working with people groups from the Napo River in the Amazon Rain Forest to the Andes Mountains. I shouldn’t be here. I love her, but this is beyond what I can handle. “I’m so happy you came,” Ximena* tells me. She looks so old. Not like the girl I went to school with, not the girl I used to play with, not the girl I called a best friend. She’s a mother now. An adult. Someone living a life I cannot imagine — a life I don’t want to imagine. One month ago, Ximena gave birth to a very premature little girl. She and her boyfriend didn’t expect the baby to live… but she did. They named her Alejandra. We were able to visit Ximena after she was released from the hospital, but we weren’t allowed to see the baby. It was a very difficult visit, filled with a lot of tears and a lot of discomfort for all of us. I asked Dad to bring us out here. I had promised Ximena we’d come see her. I told her we still loved her, that we still cared for her and we wouldn’t judge her. So here we are, standing beside a group of concrete and thatch huts build nearly on top of each other. Swatting away flies and trying to act like the heat and stench don’t bother us. This is what poverty looks like. This is what it looks like and smells like and feels like. This is what it is to see desperate people, hungry children, broken lives. This is how she lives. Dirt floors. Rough concrete walls. A rusty tin roof. A bed that’s falling apart. A broken dresser. No light. No bathroom. “Okay,” Ximena hands me the baby. Tears press on the backs of my eyeballs. Joy, confusion, happiness, and disbelief melt together into just feeling lost. Just sitting on a bed with my best friend, talking. Just like old times. In the old times, we talked about music and boys and clothes. Now, we’re talking about food and money, and Alejandra. Part of me wants to leave. Tell her I didn’t sign up for this heartbreak and pain and seeing her like this. I didn’t give a list of conditions. I didn’t say if. I didn’t say as long as. *The names in this post have been changed in order to protect the privacy of certain individuals.